Anthony Joshua will fight Wladimir Klitschko on 29th Saturday April at Wembley Stadium at around 10pm. It is the second headline bout of the year, and the biggest heavyweight fight in some time. 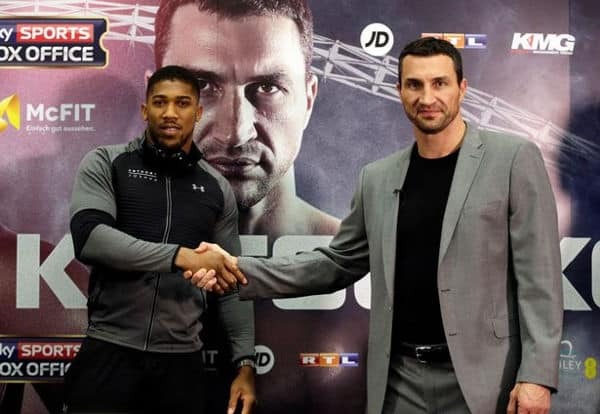 Joshua and Klitschko will fight it out in front of a packed Wembley of 90,000 fans. What has been really refreshing about this fight is the mutual respect shown between the fighters. Earlier in the year Haye fought Bellew and the lead up to the fight became almost comical as they both tried to increase coverage and Sky Box Office sales. The whole facade was confirmed as soon as the fight was over, with both boxers embracing each other, and Haye ‘hinting’ he might be up for a second fight. In Sky’s ‘The Gloves Are Off’ TV show, where the two boxes face each other and discuss the fight, both were very composed, calm, and Klitschko acted his usual charismatic, articulate self. He told Joshua, that if he loses to him, he will congratulate him, and if he beats him, he will help bring him back. Much classier than Haye’s remarks about breaking Bellew’s eyes sockets in the lead up to his fight. Timing of the fight has been a key point of discussion. Some suggest that this is perhaps a challenging fight or two too early for Joshua, and potentially too late for Klitschko. Klitschko lost his heavyweight title to Tyson Fury back in November 2015 and has described this fight opportunity as ‘meaning everything’ to him. At 41 though, he will know that this is probably his last big fight if he loses. Keen to dismiss age as just as a number, and insisting he feels great, he will need to draw on all of his experience. He claims it will be 50/50, but what do the bookmakers think? They universally think that Anthony Joshua will win, and Bet 365 are pricing him at 1.36 to win, and Klitschko at 3.25 (correct at time of publishing and subject to change). If this goes the way bookmakers are anticipating it might, then this will signify the end of an era and the start of a new one. The only place to watch the fight is on Sky Sports box office. The fight costs £19.95 and will be made instantly available to you. Sure it may be possible to find a stream, but it’s likely to be full of ads, and will potentially stop during the fight so we’d recommend either stumping up the cash with a group of mates, or simply heading to the pub. For the Haye vs Bellew fight, Sky Bet had a promotion if you bet £5, then you would be able to stream the fight for free. Should they do this for the Joshua fight, we’ll update this page. Joshua is favourite to win the fight, priced at 1.36, and Klitschko priced at 3.25 to win. You can back Joshua to win by KO, TKO, or disqualification at just 1.61. Bookmakers don’t think this fight will go the distance. You can back for it to do so at 3.50. We would expect betting offers for existing customers to be made available mid this week ahead of the fight. For previous large bouts, Boylesports and SkyBet have had offers. If you’re looking to open a new account, then you’ll receive a bonus which you could use for this fight. For those offers, head over to our homepage. William Hill (NewCustomers) – You can back Joshua to win at 6/1 using this short term promotion. The max bet is £10 and winnings are paid as a free bet. Boylesports (Existing Customers) – Get money back as a free bet up to £20 on round betting if the fight lasts three rounds or less. Ladbrokes (Existing Customers) – Money back on losing round betting stakes up to £25 if the fight goes the distance.